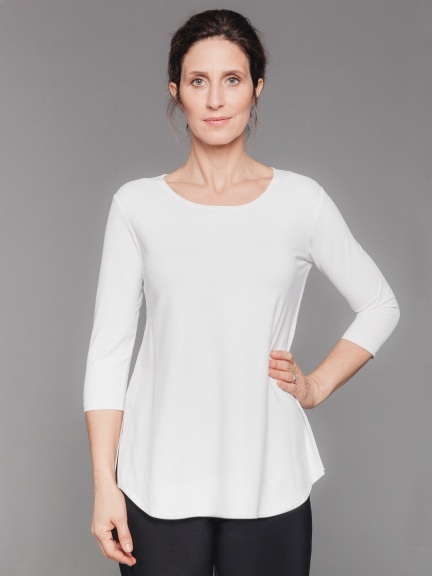 Longer tee with scoop neckline, side vents and a slightly rounded hem. Made from a fluid matte jersey in Canada. The colors Aruba, Black, Blush, Ivory, Lime, Mushroom, Navy, Papaya, Platinum, Poppy, Red, Sapphire, Stone, Taupe, White & Wine are available in any out-of-stock size as a Special Order, estimated to ship on May 10th for Black, Navy, White, Blush, Poppy, Azure, Cactus, Lemon, Lime, Platinum, Sapphire and July 5th for other colors for orders placed today.